Why The Application-Centric Design in Joget Workflow v3? Our previous blog post, Sneak Preview of Joget Workflow v3, has gotten a lot of attention from Joget Workflow adopters as well as industry watchers in the BPM space. Many people are surprised with the application-centric approach that we are pursuing, but at the same time, the comments and feedbacks we have received have been very encouraging! What Are We Brewing for Joget Workflow v3? It's no longer a secret that the Joget Workflow development team is driving the project at full throttle to release version3 Beta. Joget Workflow v3 will mark a very significant milestone: to realize the ultimate goal of Joget Workflow being an application builder. In Joget Workflow v3, the design focus is enhanced from process-centric to app-centric. In other words, we no longer confine ourselves to just creating processes; we now create a web application that contains multiple processes! 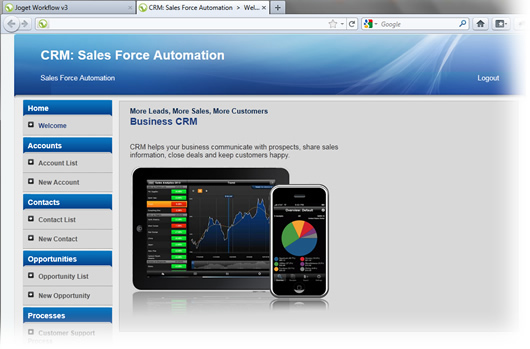 For example, a CRM application can be made up of Pre-sales Process, Customer Support Process, Lead Management Process, etc.